Chasmanthium latifolium is native to the wooded slopes and damp forests of southeastern North America, from Texas north to New Jersey. 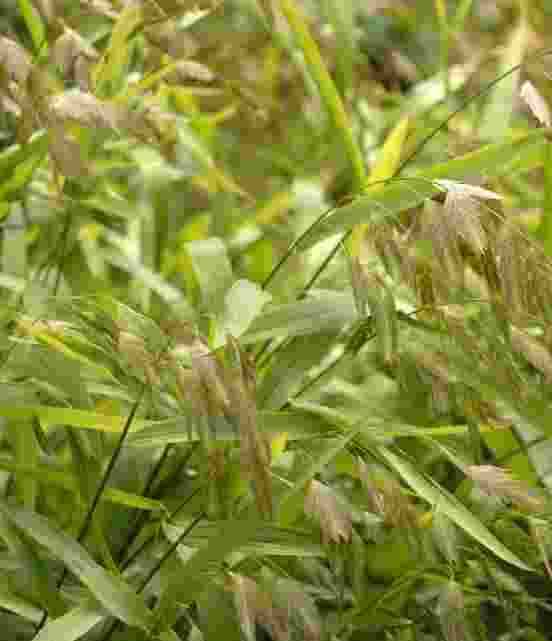 It is a clumping grass that is treasured for its showy drooping flowers and unique bamboo-like foliage. This native grass is an adaptable plant that will grow in full sun to quite a lot of shade. We find that it grows best in morning sun in humus rich soil that does not dry out. The foliage is upright with a slightly arching habit. In the fall the foliage develops lovely warm bronzy tones. The interesting tan seed head rise above the foliage and wave in the wind. It has not reseeded in our garden. Chasmanthium is very tolerant and easy to grow. Sun to part shade and dry to wet conditions suit it. Moist soil in light to partial shade is the ideal environment. The seed heads are very attractive and should be left for winter interest. Cut it down in the spring before new growth begins. Divide it in the spring or watch for seedlings. Self seeding is not a problem in our zone.